Magic Sculpt is a two-part epoxy putty specifically designed to meet the needs of modelers, crafters and sculptors alike. 1 lb kit. Comes in two 8 ounce jars. Natural color, blend equal parts to use. See instructions below. 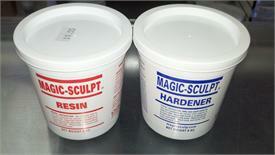 Magic Sculpt is one of the only epoxies that will smooth out with water. Its grain structure is finer than any other product available and will not shrink or crack even when formed in large structures. It can be shaped by hand or with modeling tools, sanded, carved, painted; you can attack it with a grinding tool and the cured material will not break apart or lose its shape. Magic Sculp will cure at room temperature. Take out only that amount you will be able to sculp with before it gets hard. Take out equal amounts of Hardener and Resin. Roll out into individual balls. The reason for this is we want equal sizes. We are measuring volume not weight. They do not have to be exact, close is good enough. Next take the balls and form a cylinder shape with them. Take the two cylinder shapes and put them together. Once together, start moving your hands back and fourth. Your cylinder will lengthen because of this process. Just fold it in half. Once you have folded it, repeat the process until all the marbling is gone. You are done mixing when you have one uniform color. This process will causes friction and heat. Magic Sculp might become sticky. Talcum powder is great for preventing it from sticking to your hands and will not hurt Magic Sculp. I let it sit for awhile after mixing it together. This lets it cool down and lose its stickiness. Fishing line makes a great cutting tool. Pliability changes over curing time. Only working with Magic Sculp will you learn what you can do and can not do before it cures. You can add to already cured Magic Sculp and you can smooth Magic Sculp with water. Your imagination is the only limit when it comes to devising uses for Magic Sculp.